16-inch Water Wheel Fountain with pump and lights. This casual piece is the perfect addition to any setting. Perfect on the deck, patio or anywhere in the yard. Bring life to your special setting. Easy to assemble, comes complete with everything you need, including an energy efficient pump and LED lights. Made from Comp-Cast., a resilient stone, fibre and resin material that provides strength, without excessive cumbersome weight. Angelo Decor offers a one year limited warranty on all fountain components, including pump. All other electrical components, including lights are covered for a 90 day period following the date of purchase. Warranty does not cover damage caused by environmental factors or neglect. For more detailed information on use, care, cautions, and warranty. 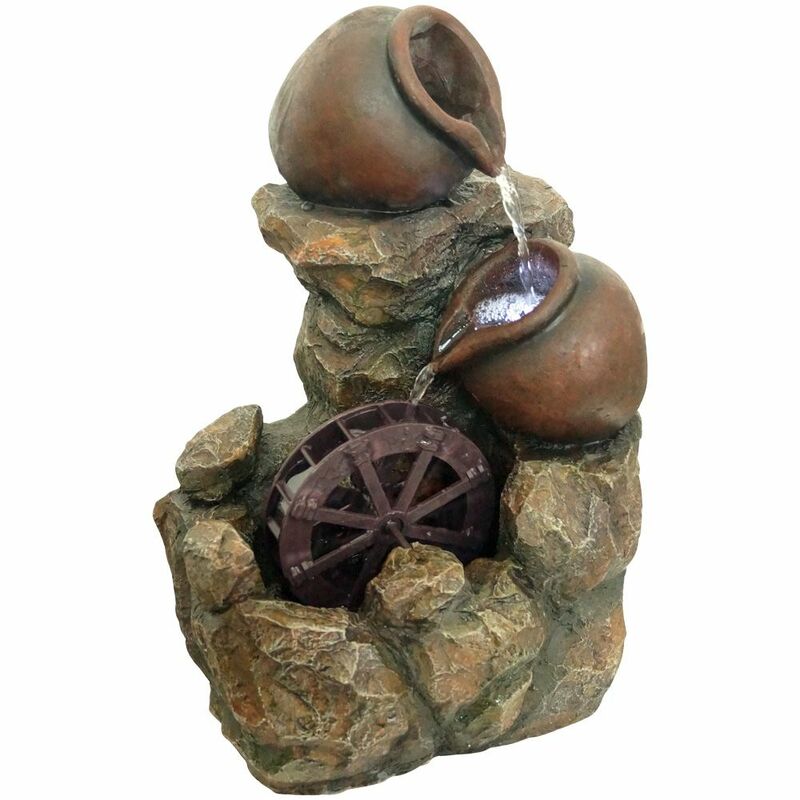 16-inch Water Wheel Fountain with Pump and Lights 16-inch Water Wheel Fountain with pump and lights. This casual piece is the perfect addition to any setting. Perfect on the deck, patio or anywhere in the yard. Bring life to your special setting. Easy to assemble, comes complete with everything you need, including an energy efficient pump and LED lights. Made from Comp-Cast., a resilient stone, fibre and resin material that provides strength, without excessive cumbersome weight.